All Democrats will face a dilemma on health care: what to do about single payer? Further complicating the question is the fact that there are numerous proposals out there that seek to do everything from allowing more people to buy into Medicare, to a complete single government payer approach. In this memo, we caution that the version of single payer that specifically abolishes private insurance is substantively and politically fraught. On the one hand (like “repeal and replace”) it’s simple, can fit on a bumper sticker, and has a small, but very vocal following. But also like repeal and replace, it has a glass jaw—it doesn’t hold up to scrutiny particularly well and opens up a series of vulnerabilities. Specifically, House and Senate single payer bills explicitly outlaw private insurance and employer-provided insurance as we know it. There is a reason that of the 92 Democrats running in red-to-blue House districts in 2018, only two ran ads supporting Medicare for All, and they both lost races they should have won. Anything like Sanders-style single payer is ripe for attack. 1. Even those wanting a bigger government role in health care are skeptical. 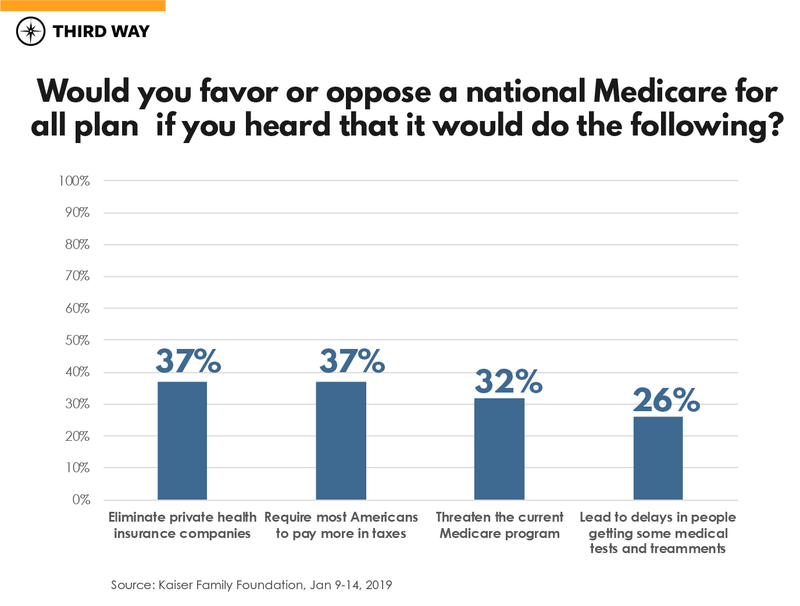 Based on polling from the Kaiser Family Foundation, public support for Medicare for All plummets when people learn that it eliminates private insurance (support drops from 56% to 37%), requires most Americans to pay more in taxes (support drops to 37%), threatens Medicare (support drops to 32%), or leads to delays in tests and treatments (support drops to 26%). And in a 2019 CNN poll, 54% of those who support coverage for everyone say private health insurance should be protected. 2. It costs $32 trillion over ten years and puts workers on the hook. In our polling, support for Medicare for All drops from 51% to 29%, when the cost is mentioned. The Sanders bill has proposed a series of tax increases to only partially pay it. One of his tax increases includes raising taxes by 8.4% on everyone (2.2% paid by families and 6.2% paid by employers, which most economists believe would come out of the employee’s paycheck). Single payer supporters will argue that employers will raise wages because they won’t have to pay for insurance. But we just saw that businesses that pocketed Trump’s tax cuts often went on a stock buyback rummage sale helping shareholders—not workers. 3. 156 million people will lose their employer-sponsored coverage. Let’s not mince words here: Section 107 of the single payer legislation outlaws private health insurance. This is a hard circle to square. Right now, 156 million mostly-satisfied people get coverage through their employer. Those plans would be replaced under single payer in favor of a plan that they may not like. Democrats faced a huge backlash when a few million people saw their coverage change under the ACA. How about half the country? 4. Medicare Advantage would be gone. Over one-third of Medicare beneficiaries are in Medicare Advantage­­—private plans offering comprehensive benefits—which would be eliminated under single payer. This would give Republicans the strongest talking point on health care that they’ve ever had: Democrats will end Medicare as we know it. 5. Working- and middle-class health care workers will likely lose pay. One reason other countries pay less for health care is that doctors and nurses get paid far less in Europe than in the US. The current median wage for health care practitioners here is a solidly middle-class $64,770. But those workers will see lower salaries thanks to lower reimbursements for services. There are 3 million nurses in America. Eventually, they’ll be told that Democrats’ health care plans will cut their pay. And in Europe, a registered nurse earns over $20,000 per year less than an American nurse. 6. Voters have rejected single payer when it’s been on the ballot. California’s single-payer Proposition 186 won just 26.6% of the vote in 1994. In 2002, Oregon’s single-payer ballot measure won just 21.5% of the vote. Yes, that may seem like ancient history, but in 2016, Colorado’s single-payer ballot Amendment 69 got 21.2% of the vote. It even lost by 24 points in Boulder, one of the bluest counties in America. A litany of progressive leaders have voiced concerns with single payer since it caught fire among the left. Paul Krugman said that “Democrats could eventually find themselves facing a Trumpcare-type debacle.” Ron Pollack of Families USA warns, “Maybe we should hit pause before we get on this bandwagon.” Jonathan Chait writes, “A single-payer plan would be nice, in a world that looks nothing like the one we inhabit.” Former Congressman Henry Waxman notes, “[S]ingle-payer is no policy panacea…[and] would require tax increases at politically suicidal levels.” And New York Times Columnist Austin Frakt notes that private plans are “more responsive to consumer demand” and offered prescription drug coverage decades before Medicare. Democrats have the opportunity and an obligation in 2020 to make Trump a one-term president and put this country back on track. Once we do that, we can finally achieve universal coverage and lower health care costs for all. But if Democrats back a single payer plan, it will make it far tougher to beat Trump. So handle with care and be aware that there are other attractive options to accomplish that shared Democratic goals of lowering costs and covering everyone.